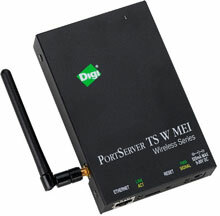 The Digi PortServer TS W has been discontinued. No direct replacement is available. The PortServer TS W family of device servers makes it easy to network-enable serial devices to a wireless 802.11b infrastructure. Users will appreciate the new external antenna and hidden wireless card offered by the versatile one-, two-, and four-port solutions. The PortServer TS W family also delivers easy installation through an auto-run wizard on the CD for Microsoft and Unix platforms, EIA-232/422/485 serial ports for connectivity to almost any serial interface, and many advanced networking features.